The most recognized drugs of abuse include marijuana, cocaine, heroin, methamphetamine, and ecstasy. Synthetic drugs are especially dangerous because they are difficult to regulate. Synthetic drug abuse affects the brain in similar ways to the naturally-occurring compounds they mimic. Sometimes these effects are even more potent because synthetic drugs are purer forms of the psychoactive substance. In 2016, the average street price of one kilogram of heroin was SLR 9 million. Compared to 2015, the average street price of heroin has increased by 13%. In 2016, the average street price of a kilogram of cannabis and opium was SLR 22,000 and SLR 1.5 million respectively. Abuse of psychotropic substances is becoming a significant problem in Sri Lanka. People addicted to one or more of these substances, either after medical use, or to evade withdrawal symptoms of heroin addiction, when heroin is not available in the market. Although these substances are controlled medicines, they seem to be freely available on the black market. According to the data and incidents reported in 2016, Western province of the country shows a higher tendency for use of psychotropic substances and prescribed medicines. 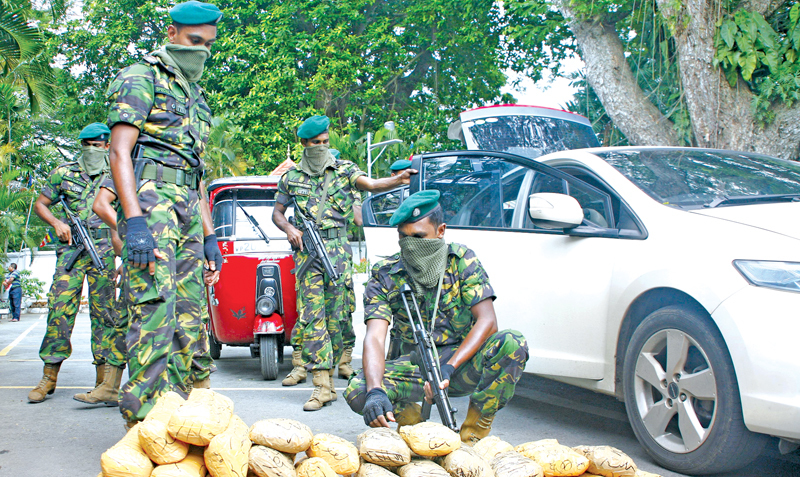 Sri Lanka is a transit point for drug trafficking from Pakistan and India smuggled to Europe. During the past five years, heroin seizures and arrest information revealed that South West Asian heroin (Brown Sugar) is mainly smuggled from India and Pakistan. The reported number of clients treated for drug abuse island-wide was 2355 in 2016. Among them, 826 (35%) clients were from the treatment centres of the NDDCB, 684 (29%) were from Prisoner Diversion Scheme of the Department of Prisons, 474 (20%) were from the nongovernment organisations and 371 (6%) were from Kandakadu Treatment and Rehabilitation Centre of Bureau of the Commissioner General of Rehabilitation. The majority (51%) of the clients were treated from Colombo district. Sixty two percent of rehabilitated persons were aged 30 years and above. Treatment admissions have increased in 2016 by 59% compared to that of 2015. The total number of persons arrested for drug-related offences was 8,570 from January to June 2015 from recorded to the database. Of the persons arrested 1,795 were heroin users. 21% per cent of the persons arrested were aged between 30 and 34 years. Of the reported arrests, the majority (2,350) were arrested from Colombo district. When considering all arrests, 38% was from the western province. Among the reported persons, 99% were male and 1% was female. Of the persons reported 5,732 (67%) were married and 2,804 (33%) single. Among the total drug-related arrestees, 58% had studied between year 5 and 10. Salient features of the Drug Dependent Persons (Treatment and Rehabilitation) Act, No. 54 of 2007. 10. (1) Where an Officer-in-Charge of a Police Station receives information that any person is a habitual user of dangerous drugs and has since become a drug dependent person, he shall forthwith take such steps as may be necessary to cause such person to be examined by a Government Medical Officer. The Government Medical Officer shall thereupon submit a report to the police officer who referred the drug dependent person to him or any other officer attached to the relevant Police Station, setting out the results of such examination. The report shall contain reasons for his observations that such person is or is not, a drug-dependent person and details as to the extent of such person’s drug dependency. (2) If according to the report of the Government Medical Officer the person examined by him is a drug dependent person, the Officer-in-Charge of the Police Station shall produce such person or cause such person to be produced, before a Magistrate who shall take action in accordance with the following provisions of this section. (3) A Magistrate before whom a person produced upon the completion of the procedure set out in subsection (1) and (2), shall make Order that such person be sent for compulsory treatment and rehabilitation at any Treatment Centre designated or licensed under this Act, as may be determined by such Magistrate. 5) Where a person is committed for treatment under subsection (4) the Commissioner of Prisons shall after consultation with the Director of the Treatment Centre take such steps as are necessary to transfer such person from the prison to the Centre to undergo treatment for such period as determined by Court. The release of persons from Centres. 11. (1) any person admitted to a Treatment Centre under the preceding provisions of this Act may be released from such Centres on the recommendation of the Director of the Treatment Centre after consultation with the Assessment Panel and subject to any terms and conditions which may be imposed by the NDDCB. The Drug Dependent Persons (Treatment and Rehabilitation) Act 2007 offers great hope to address issues of substance abuse offering voluntary as well as compulsory treatment pathways. We are though way behind having a sufficient number of clinics. The challenge though is to expand the treatment facilities on offer, rapidly fast-track the case review and management process and walkway from the current practice of placing people in Prisons. The Police would need to become friends and not opponents of users whilst interventions have to be scaled up within locations where persons are being held currently and simultaneously for those in their own homes. They could ostensibly organise filed based clinics in neighbourhoods where usage is common; clinics have to be proactively conducted for those unfortunately committed within the walls of prisons which have a high population. The problem is universal and societal. It's not going to go away. Ultimately it calls for giving optional pathways for users working with kith and kin, families or caregivers.